Jewish Home leader slams IDF decision to leave opening in wall protecting Beit El, aversion to demolishing terrorists' homes. Education Minister Naftali Bennett continued to lead a hawkish line in the Political Security Cabinet. According to Channel 10's Barak Ben David, IDF Chief of Staff Gadi Eizenkot said at the weekly Cabinet meeting Sunday that the wall surrounding the community of Beit El which was penetrated by a terrorist who stabbed a soldier on Friday, was intended to prevent gunfire on the road and not infiltration. According to Eizenkot, the commander of the Binyamin Brigade made the decision to erect the wall and leave the entrance to allow Arab farmers to cultivate their fields, and claimed that the decision had no legal component. Bennett insisted that "they built the wall to protect the residents of Beit El, but they left an opening because the Palestinians 'legal rights over the residents' security will be challenged - this is exactly a 'legal component.'" The Cabinet meeting also dealt with the law to expel the families of terrorists. Attorney General Avichai Mandelblit argued that the expulsion of terrorist families is illegal. Bennett replied that precisely for this reason that a law should be passed on a subject that would allow this. IDF officials claimed that the expulsion of terrorist families would not deter potential terrorists, but Bennett insisted that the move would deter terrorists and reduce Arab terrorism. 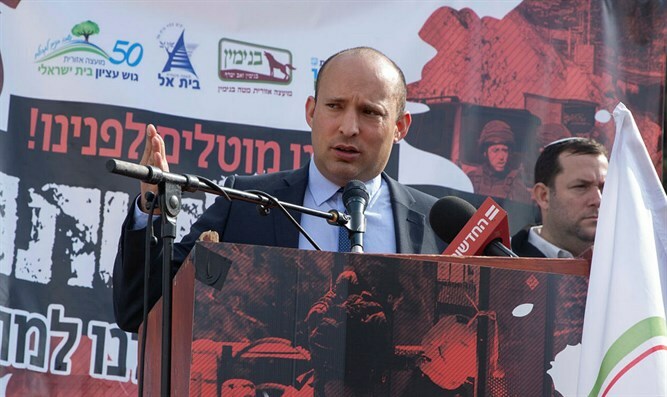 On the issue of the demolition of terrorists' houses, Bennett also confronted representatives of the IDF and the Ministry of Justice, who claimed that all the requests for house demolitions were approved in accordance with criteria set by the High Court of Justice. The chairman of the Jewish Home party said at the cabinet meeting that there were many houses of terrorists whose requests for demolition had not been submitted, and brought several examples of the homes of such terrorists.